The magic of Butterflyweed flowers! When their flowers open in July the morning sun brings a steady procession of butterflies. Swallowtails, Fritillaries, Orange sulphurs, Coral hairstreaks and Monarchs. Here our heroine is hungrily nectaring and displaying her stunning blue splashes! After some 2 hours or so of morning sunlight, butterflies do not fly to the Butterflyweed. 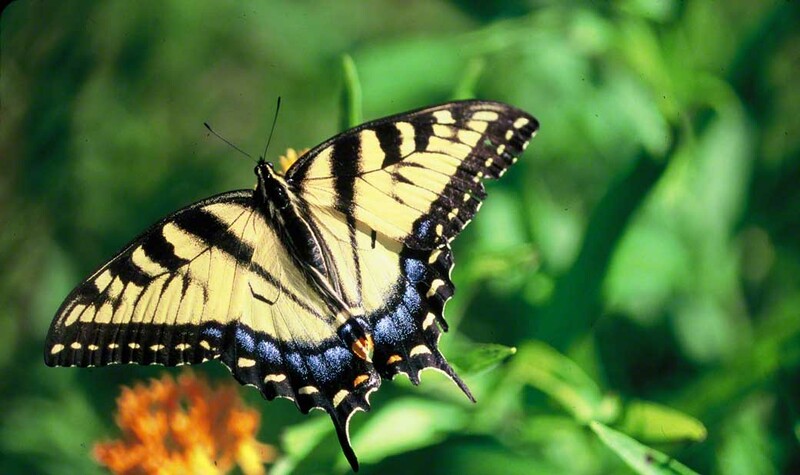 The last visitors to these flowers are usually very worn and sport heavily damaged wings. When was the last time that you saw Butterflyweed? Is is a native or an alien wildflower? What may explain the complete drop-off of butterfly activity at Butterflyweed flowers at mid-morning? Hummmmm….could it be too hot for them by then?